CRESSON — Penn Cambria improved to 4-1 with a 25-12, 25-20, 25-13 win over Forest Hills Tuesday night in high school girls volleyball action. Laken Guzic had 18 digs and 16 assists for the Lady Panthers, while Makalyn Clapper added 12 digs, 18 kills and five blocks. Mia McCarthy contributed nine kills and nine digs to go with 15 assists from Chloe Guzic and 11 service points from Maddi Laret. Bishop Guilfoyle defeated Bedford 25-15, 25-7, 25-16 to improve to 3-0 at the Pleasant Valley gymnasium. Pam Lund had 11 service points to go with 10 service points from Emily Brown. Rachel Resick had eight kills to go with 44 assists from Gabby Krug. Lyzee Wilson contributed 12 kills. Bedford got six service points each from Raquel Imler and Daphne Stayer. BEDFORD: Imler 6, Stayer 6, Smith 4. BISHOP GUILFOYLE: Lund 11, Brown 10, Meintel 8, Krug 6, Kasun 4, Nicolini 3, Yahner 3, Wilson 2, Kilmartin 2. JV: Bishop Guilfoyle, 25-10, 25-13. (BG 2-1, Bedford 1-1). JOHNSTOWN — Bishop Carroll upped its record to 2-0 with a 25-10, 25-12, 25-14 win at Bishop McCort. Carly Clark had 16 service points and nine digs to go with 15 service points and 12 kills from Maddie Murphy. Anna Haigh added 11 service points and eight assists. BISHOP CARROLL: Haigh 11, Clark 16, K. Yahner 6, Repko 2, Murphy 15, Muriceak 2. JV: Bishop Carroll, 25-21, 25-19. WILLIAMSBURG — Sydney Lechner’s 17 assists and 16 service points were game-highs that helped Bellwood-Antis to a sweep over Williamsburg (25-8, 25-12, 25-17). Karlie Feathers delivered 12 service points, including five aces, and Sakeria Haralson registered 12 kills and three blocks for the Lady Blue Devils. Bellwood-Antis won 25-8, 25-12, 25-17. Morgan Clouser fronted the Lady Blue Pirates with five service points, while Hailee Jones and Paige Gunnett had four blocks each. BELLWOOD-ANTIS: Heaton 7, Feathers 12, Haralson 3, Kies 7, Lechner 16, Yingling 4. WILLIAMSBURG: Gunnett 1, Smith 2, Clouser 5, Kensinger 2, Harclerode 2, Kipe 1. Records: Bellwood-Antis (2-1); Williamsburg (0-3). JV: Bellwood-Antis won, 25-12, 25-16. Records: Bellwood-Antis (1-2); Williamsburg (0-3). 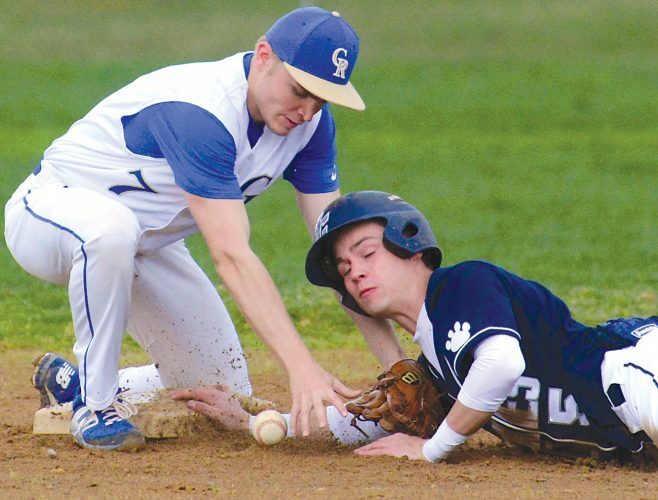 MARTINSBURG — Central defeated Bellefonte, 3-1, to pick up a Mountain League victory at home. The Lady Dragons took the first two sets (25-15 and 25-12) before Bellefonte won the third (25-18) only to have Central close out the match with a 25-23 win in the fourth set. Brinley Bowers’ 27 assists were tops for the Lady Dragons, while Lanie Heuston had 11 digs and Bethany Wyant tallied 10. JV: Central won, 27-25, 13-25, 15-13. PORTAGE — Portage defeated Conemaugh Valley 25-18, 25-17, 25-7 to improve to 1-2. Olivia Kissell led Portage with 14 service points and 10 assists to go with 12 service points and six digs from Emma Kissell. Teammate Kayley Sossong added 11 service points, including four aces. PORTAGE: O. Kissell 14, I. Kissell 12, Benton 8, K. Sossong 11, Koval 4, Crum 5, Teno 3. PATTON — Somerset knocked off Cambria Heights in four sets, 25-21, 21-25, 25-15, 25-19. Olivia Conrad had 25 digs and 20 kills for Heights, Jocelyn Rezk had 23 digs and 12 kills, Emily Henry had 13 kills and eight service points, and Nicole McCombie had 34 assists. Anna Lake led Somerset with 32 assists, and Abbey Smith had 14 kills. CAMBRIA HEIGHTS: Conrad 4, Rezk 2, Becker 3, Hayes 6, Henry 8, McCombie 3, Packard 3. JV: Cambria Heights, 25-17, 25-12. Heights’ jayvees are 3-0. FLINTON — Mount Union edged Glendale in a five-set thriller, 28-26, 15-25, 25-16, 21-25, 15-10. Olivia Reese delivered 21 digs and nine kills for Glendale, and Katianne Rydbom had four digs and 19 assists. GLENDALE: Reese 12, Wolfe 11, Simmers 10, Rydbom 10, Hamilton 8, LeMaster 7. JV: Mount Union, 25-22, 25-14. WINGATE — Tyrone battled Bald Eagle Area throughout but was swept, 25-12, 25-16, 25-23, in three sets during Mountain League action. Ebonee Rice led the Lady Eagles with 10 digs and four service points, while Mattie Cherry collected 16 assists and Brianna Foy had seven service points. JV: Bald Eagle Area won, 25-12, 25-12. Record: Tyrone (1-1).